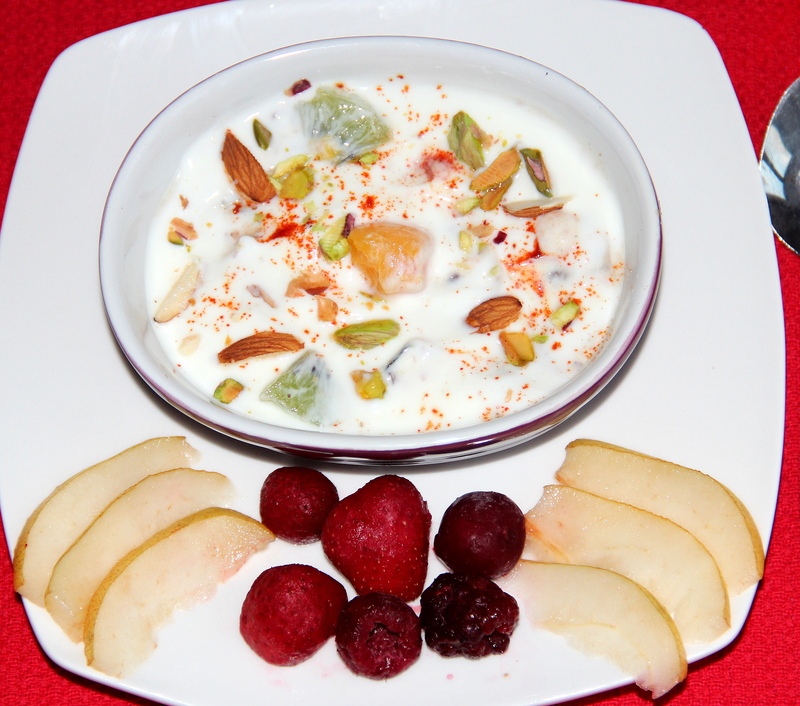 The simplicity of fresh fruit, dry nuts with plain yogurt makes so refreshing on a hot summer day. More than the salad this can be a great accompaniment and this makes a great snack that you can dig in whenever you crave for some healthy dessert. Combine beaten yogurt, black salt, cumin powder, chilli powder, dates syrup/honey in a bowl. Add fruits and nuts mix well, refrigerate and serve chill. Black salt can be replaced with table salt. Posted on August 17, 2014, in Dips, Dips, Indian, International, Soups, Salad and Wraps and tagged Chitras healthy kitchen, drchdietfood, Fruit and nut raita, Healthy dip. Bookmark the permalink. 26 Comments. Sure M-R….will wait for you. …have a lovely day…. It looks yummy and also it’s such a healthy combination of ingredients! The yogurt is also very good for you, with all of its healthy microbes. I’m going to try roasting and grinding my flax seeds like you suggest here. They are impossible to grind raw. I hadn’t thought of roasting them first. That should do the trick. Thanks for the ideas. This is my kind of dessert ❤ nomnom! Yum Chitra, healthful and delicious. I love yogurt, fruit and nuts. This looks very fresh. I would love to have it any time of the day! Am crazy about nuts so try to include where ever possible….thanx a bunch Dear G:)….. Thanks for your wonderful feedback Bikramjit !